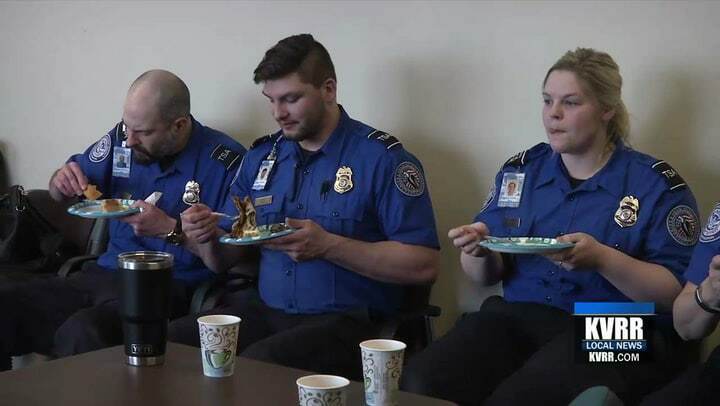 FARGO, N.D. — TSA agents are working without pay during the US government shutdown, but one group decided to serve them through a major act of kindness. The Somali Community Development of North Dakota, along with the Islamic Center of Fargo, teamed up to serve traditional Somali food to TSA agents. Abdiwali Sharif, executive director of the Somali Community Development of North Dakota, first came through Hector International as a refugee. “A decade ago I came through this airport with no English, no language, nothing. We are part of this community, we have kids here, half of my life I’ve been here,” he said. Now he’s giving back to TSA agents at the airport. “We want to recognize the services they’re doing, all the federal workers, we want to appreciate them for working hard during this hard time with the government shutdown, so we want to appreciate them for the work,” he said. He says food has the power to connect all people, regardless of their background. “The way the food is tasty and beautiful, that’s how people are beautiful too,” he said. “It’s not a lot, it’s just lunch, but we just want to appreciate the officers and especially federal government workers at the airport, we just want to remember them and appreciate them,” Shariif Haashim with the Islamic Center of Fargo said. “We want them to know, the pain you’re feeling, we feel the pain too, so that’s why we’re here for you guys,” Muhiyadin Abdullah Ali, also with the Center, said. For many like Sharif, the airport is the beginning of a new chapter in their lives. “One of the great experiences is that you see a family that comes in through the airport, with no language, no experience, nothing, they’ve never been in new country, and throughout time, you will see them grow in terms of the language, working, driving… after a year you see them helping and contributing to the community, that is a really rewarding and beautiful thing to see,” he said. According to the Somali Community Development Group, many refugees arrived in the F–M area in the mid–90’s and that number is rapidly increasing.